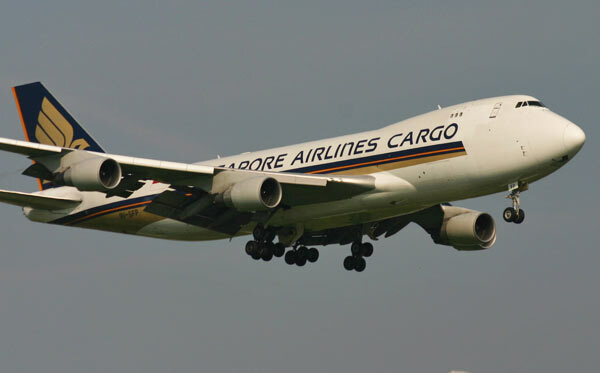 A Boeing 747-400F freighter of Singapore Airlines Cargo. The Boeing 747 Jumbo Jet was the largest passenger aircraft in operational service in the world for almost forty years, until in October 2007 the Airbus A380 took over this position. The 747 was the first widebody aircraft to fly and being much larger than its predecessors like the Boeing 707 and Douglas DC-8 meant a revolution in air transport. The history of the 747 started halfway the 1960s. Boeing lost the competition for the development of a large airlifter for the US Air Force in 1965 to Lockheed's C-5A Galaxy and sought ways to apply the experience gathered on this project to a big airliner. In March 1966 the Boeing board of directors decided to go ahead with the 747 programme and one month later Pan American World Airways announced the purchase of 25 aircraft. Many airlines followed, not always because had enough passengers to fill the aircraft, but often because their managements feared that the Jumbo Jet would make the DC-8 and 707 look obsolete in the eyes of the travelling public. The first designs of the intended 747 looked much like a military transport. The drawings showed a high-wing and room for up to 800 passengers on two decks. Boeing concluded, however, that such an aircraft would be too big for the aviation world of the 1970s. The engineers took a clean sheet of paper and designed a smaller aircraft for up to 500 passengers and a low, relatively small wing for fast and efficient cruising and a sophisticated system of flaps for low speed and good handling characteristics. These high-lift devices were even a step beyond the already very advanced systems used on the 727. The 747 is the first civil aircraft fitted with high-bypass turbofan engines, which are more powerful and economical than earlier jet engines and less noisy. An important decision was the choice for a wide single passenger deck instead of two. To get a better nose shape, Boeing decided to put the cockpit on top of the passenger cabin. For aerodynamic reasons engineers faired the cockpit gently into the main body, creating a small upper deck that could be reached via a spiral staircase, remembering Boeing's earlier Stratocruiser airliner. For the final assembly of the Boeing 747 Boeing had to construct the largest building (measured in volume) in the world, at Everett Paine Field, near Seattle. On 9 February 1969, the 747 flew for the first time. The FAA certificied the aircraft type on 30 December 1969 and Pan Am started commercial operations on 21 January 1970 between New York and London. The first version, introduced by Pan Am, was the 747-100. Boeing soon followed with the 747-200B, which took to the air for the first time on 11 October 1970. The first airline to fly this version was KLM. Other early versions are the 747-200F Freighter with a hinged nose and an optional side cargo door, the 747-200C Convertible with a cabin that could easily be changed from passenger layout to cargo configuration and the 747-200M Mixed (or Combi) with a combined passenger and cargo main deck. The 747SR is a short-range version for routes demanding high capacity. This version is mainly used on domestic flights in Japan. The Boeing 747SP (Special Performance) is a short-body long-range version of the Jumbo Jet. It flew for the first time on 4 July 1975 and the first delivery to Pan Am took place in March 1976. The SP's fuselage is 14.35 m (47 ft 1 in) shorter compared to the earlier 747-models. SP components are about 90 per cent common with the 747-100 and -200. The vertical tail is increased in height and area and the construction of the aircraft is lightened where possible and cost-effective. No more than 45 747SP aircraft have been sold. The first flight of the 747-300 took place on 5 October 1982. This version's most important difference compared to the earlier models was an extended upper deck, a 'longer bulge', so to say with room for extra passengers. The first 747-300 entered service with Swissair in March 1983. Some 747-200s, including ten KLM aircraft, were modified to have the stretched upper deck as well. Later KLM had two of these modified 747-200s converted to freighters. 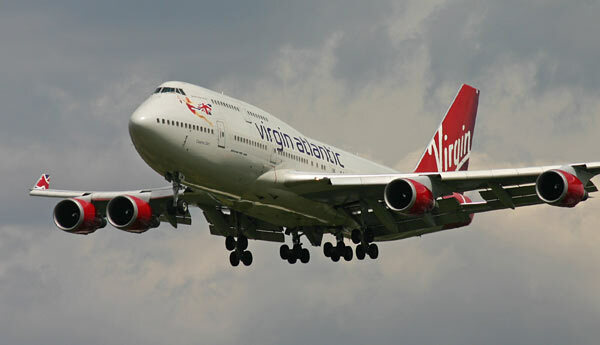 Boeing 747-400 of Virgin Atlantic. During the late 1980s Boeing developed the 747-400, with the same fuselage length and extended upper deck as the 747-300, but with a larger wingspan, winglets, a highly modernised digital flight deck, higher weights and a lower fuel consumption thanks to improved engines. The 747-400 made its maiden flight on 29 April 1988. It is also available in a 'short-bulge' cargo version (747-400F)and as a combi (747-400M). The 747-400D (Domestic) for short-range flights doesn't have winglets. The 747-400ER is an improved extended range version, of which also a freighter variant exists, the 747-400ERF. Boeing sold more than 1300 aircraft of all 747 versions. 724 aircraft were so-called 'Classics' (747-100, 747-200, 747-300 and 747SP). Today a growing number of passenger aircraft is being converted to freighters. Some Boeing 747 aircraft are used for special purposes, like two 747-200s designated 'Air Force One' as the U.S. presidential aircraft and four 747-200s designated E-4 as airborne emergency command and control posts for the US Air Force. One 747 was modified to ferry space shuttles between California and Florida and one modified 747SP is flying as an astronomical observatory with an infrared telescope on board. The newest version of the Boeing 747 is the 747-8, of which Boeing developed two versions: the 747-8I (Intercontinental) passenger plane and the 747-8F (Freighter). Both versions will be 5,6 meter longer than the 747-400. The new version is named 747-8 to underline the use of modern technology from the 787 Dreamliner twinjet, including the General Electric GEnx turbofan engines. The 747-8 is the first stretched Jumbo Jet version which went into production. Boeing first proposed a shorter stretch for the 8I Intercontinental, but later decided to give both versions the same fuselage length. The cargo version has a short upper deck, like the 747-100/200 and the 747-400F. The passenger version has the stretched upper deck of the 747-300 and 747-400. The 747-8I is the longest passenger aircraft in the world. The Airbus A380 is heavier and offers space to more passengers, but its fuselage is shorter. The 747-8 has a revised wing with raked tips, like on the 767-400, the later 777-versions and the 787. Boeing introduced fly-by-wire technology for most of the lateral controls and makes more use of lightweight composite materials than in earlier 747-versions. For the 747-8 the General Electric GEnx is the only available engine. In the 8I the cabin windows are larger than those of the 747-400 and similar in size to those on the 777. After some delays the 747-8F took off for its maiden flight on February 8, 2010. The type was granted its certificate of airworthiness by the FAA and EASA on August 19, 2011. Delivery of the first freighter to Cargolux was originally set for September 2009, but happened more than two years later, on October 12, 2011. The 747-8I's maiden flight took place on March 20, 2011, and FAA-certification followed on December 14, 2011. First delivery of a VIP-aircraft was on 28 February 2012 and Lufthansa received its first 747-8I on 25 April 2012. In mid-2014 Boeing had sold around 125 747-8's, including 50 8Is. 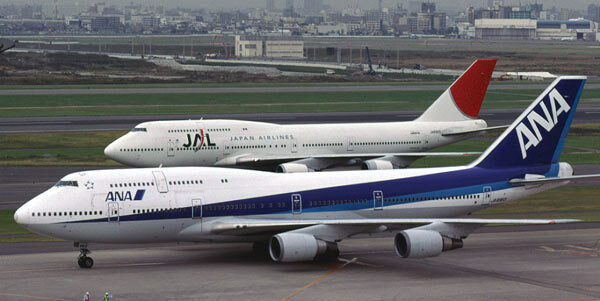 JAL and ANA fly Boeing 747-400's on domestic flights within Japan. They lack the winglets.